1. Certificate of Biblical Studies (1 year program), an Associate of Theology Degree (2 year program). There is also the Masters of Pastoral Theology for pastors who have been serving the Lord for more than 10 years. 4. Doctor of Ministry or Doctor of Theology Degree. ( Under development Contact fgroffice@gmail.com for further information ). Each program is set up for home study for your convenience. You will be expected to complete a Workbook for each course. (80% of your grade) There may be extra readings and quizzes for extra credit. A Bible Reading Comprehension exam will be given each year to test your knowledge on your Bible Reading. This will count for 20% of your grade. The Tuition is $720 per year. Select Track one or two to make up your 24 credit units 6 credits will be award for your Bible reading, for a Total of 30 Credit hours per year. Each student is required to read the Bible through, starting with the New Testament and finishing with the Old Testament. You will be required to sign an affirmation that you did in fact, read the Bible through during this period of study. On Track 1 & 2 you will be expected to read the Bible through at least twice in the 4 year program. On Track 3 you will be expected to read the Bible through at least 2 times in a 4 year program. UPON COMPLETION OF YEAR ONE - You will receive a "Certificate in Biblical and/or Ministerial Studies" upon successful completion of either Track 1, 2, or 3. YEAR ONE- You will examine Matthew through Revelations, Genesis through Deuteronomy. You will answer multiple choice questions on each of the above books (groups or sections) and read the Bible through during this year. YEAR TWO- You will re-examine the books involved in year one, as it applies to your life, your family, your community, and your nation. You will write a simple essay on each book (groups or sections) to be examined by the instructor. You will also read the Bible through. YEAR THREE - You will examine Joshua - Malachi. You will answer multiple choice questions on each of the above books and read the Bible through during this year. YEAR FOUR - You will re-examine the books involved in year three, as it applies to your life, your family, your community, and your nation. You will write a simple essay on each book to be examined by the instructor. You will also read the Bible through. 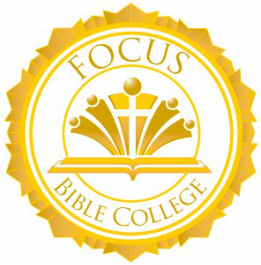 Focus Bible College presents a new program for pastors who have served in the pulpit for 10 or more years with or without formal higher education, who have served in 2 churches or less during that time. · Approximately 30/42 credits which are the compilation of Sermons, papers, tapes, course development, or discoveries in the areas the pastor has specialized in during his 10+ years of service. i.e. church administration, counseling, theology, youth ministry, senior development, jail and hospital ministries, or a combination, etc. · A Master's thesis - see THE500 for thesis requirements. This thesis may be published on the Bible College web pages for other minister to read, learn, and excel from your experiences. Psalms 34:11 LITV My sons, come, listen to Me; I will make known to you the fear of Jehovah. In preparing your thesis you must share your experiences as a pastor. The way you handle difficult situations and the way you latter might have wished you handled the situation, may be one of the areas of consideration. Share your victories, failures, and your discoveries. It is our desire that with a multitude of pastors participating in this that new pastors may learn from our experience and have a less bumpy journey. · Compiling the 30/42 credits will be done by you and your advisor to meet the Bible College's standard of excellence. The credits will consist of past developments of sermons, lessons, and discoveries that you incorporated into your ministry. It may include book reports on certain topics that had a profound effect on your ministry. 2. A compilation of sermon series that built a church on a biblical structure. i.e. A Team Effective Church with a Team Vision. i.e. An urban church structure reaching the street gangs, addicts, and homosexuals. i.e. A Deliverance church based on setting people free as a new creation in Christ. i.e. A rural church developing the farmers and ranchers for the Kingdom Planting. NO MATTER WHAT METHOD IS USED EVERYTHING MUST BE BASED AND BACKED UP BY SCRIPTURE. In other words don't tell us what some philosopher thought on a given area unless it can also be backed up by the Holy Bible. · Approximately 10 credits of practica are awarded for his/her service in the pastoral role. · The total cost for the Master of Pastoral Theology is $777. Payment programs of one or two years with 10% down are available. 1 year $777 - $77 down payment - 10 payments of $65 and a final payment of $50. No Degree will awarded until all work and fees are submitted. 2 years $777 - $77 down payment - 22 payments of $31 and a final payment of $18. No Degree will awarded until all work and fees are submitted. If you pay in full at the time of registration for the Masters of Pastoral Theology you will receive a 10% discount, making your cost only $700. 1 year $1100 - $110 down payment – 11 payments of $90. receive a 10% discount, making your cost $990. ADVISORY To be considered for the Pastoral Theology Masters Degree Program or Master/Doctor of Pastoral Theology. A Pastor must be currently serving a congregation with a good report. All reference will be checked and will be prayed over before acceptance to the program is granted. If you are accepted and serious character flaw is reveal, we will ask you to address that area and to place safe guards against it, prior to awarding the Degree. Should your application be declined you will given the reason(s) why and you will have 30 days from posting to appeal the decision. After 30 days the decision will be finalized and applicant will not be allow to apply again for one year. CLICK HERE TO PRINT THE MASTER/DOCTORAL DEGREE OF PASTORAL THEOLOGY DESCRIPTION AND APPLICATION.